For years, I worked as an elementary school teacher and enjoyed playing the blues on the side. On a whim, I brought my guitar to class one day and amazingly, every single one of my students quickly became involved – singing, dancing, and coming out of their shells. As the weeks turned into months, my musical side lesson evolved into an entirely new way of learning. Using music, I was able to reach all of my students and make the curriculum accessible to everyone, including my ELL students, students with disabilities, and those typically hesitant to take risks and jump into the mix. Soon, local businesses and events were contacting us to play for them. More importantly, all of my students began making huge strides – academically and socially. I began taking our curriculum and adapting it so it could be taught through music, dance, and song. With this multi-modality approach to learning, my students were more successful and always excited to learn. Administrators and professors of education took note of our success and began urging me to create a curriculum that could be used by other teachers. While this sounded like an awesome idea in theory, there simply wasn’t enough time in the day – teaching full time had me so wrapped up in planning for my own class, there was little additional time to create an entirely new curriculum. But, as I watched how this innovative way of learning positively impacted my own students, I knew I needed to try and make the same possible for other kids. Finally, this past year I decided to take the plunge and accepted the challenge head-on. Rather than returning to my own classroom last fall, I took a leave of absence from my teaching career and formed a non-profit, Kids Like Music. 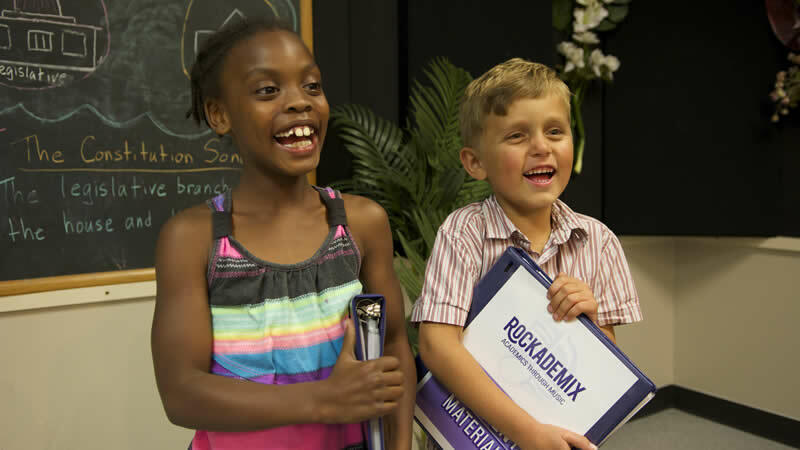 Under this organization, I am now working full-time to create the new curriculum, Rockademix. Rockademix has already taken on a life of its own – featured by the US Department of Education, professors and Grammy Award winners, it is quickly gaining followers and I, as well as the diverse group of students I’m working with, are enjoying every second! Check back here to learn more about Kids Like Music and where this exciting path is taking me!